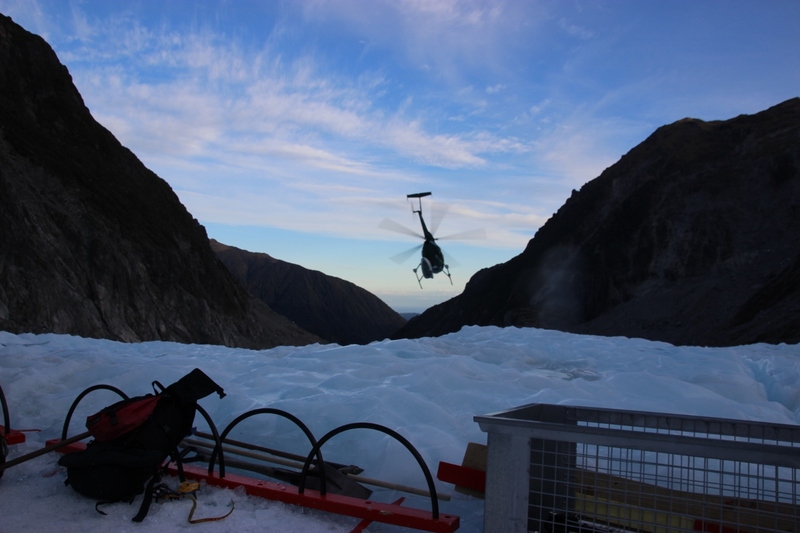 TAKING FLIGHT: Our launch pad – literally – to Fox Glacier. 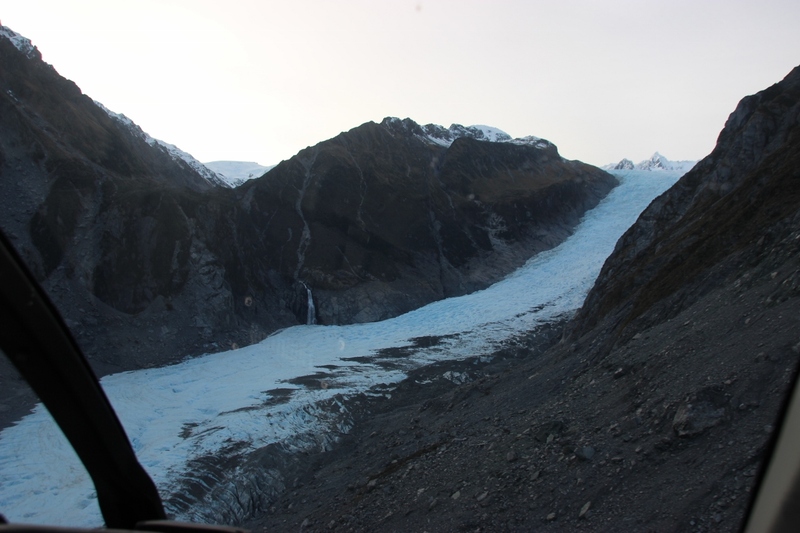 OVER HILL AND OVER DALE: The flat farm land at the base of the glacier. I love rock climbing. My rapidly, prematurely ageing frame doesn’t necessarily love that I love rock climbing, but it’s still one of my favourite adventures! The challenge is a thrill, the technical aspect is exciting and beating a route either indoors or outdoors, top roping, lead, or bouldering is an excellent sense of achievement. 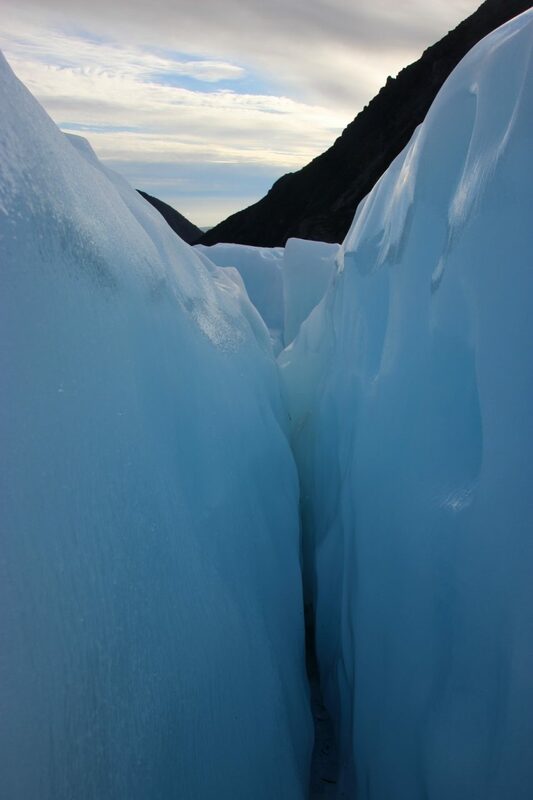 UP THE MIDDLE: Following the glacial stream towards the ice face. 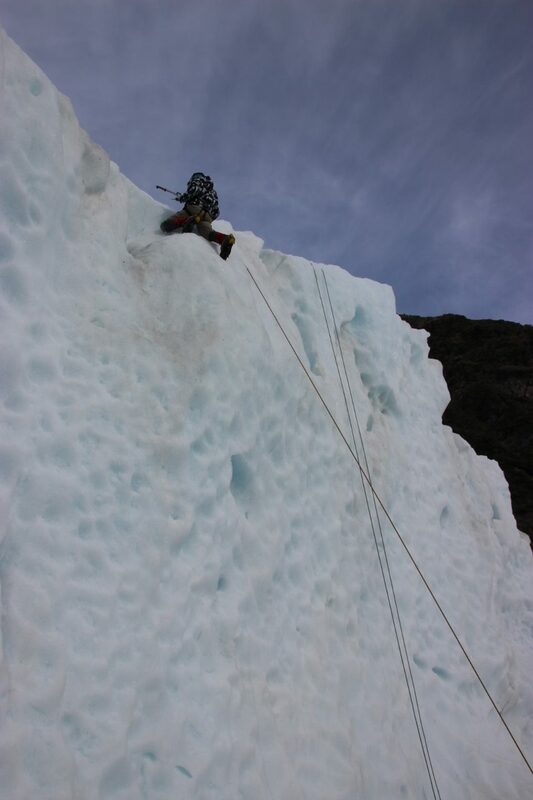 For the past few years, my time on the wall has been all too limited thanks to injury, health, and general life, so when we were travelling through the South Island of New Zealand, the opportunity to ice climb on Fox Glacier was too good to pass up! 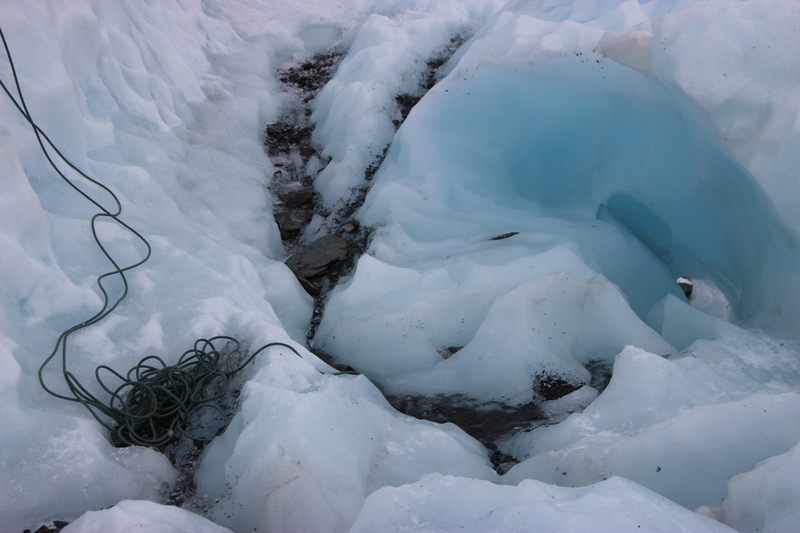 SHRAPNEL: The landing site on the glacier. INTO THE BLUE: Sunrise over the ice. 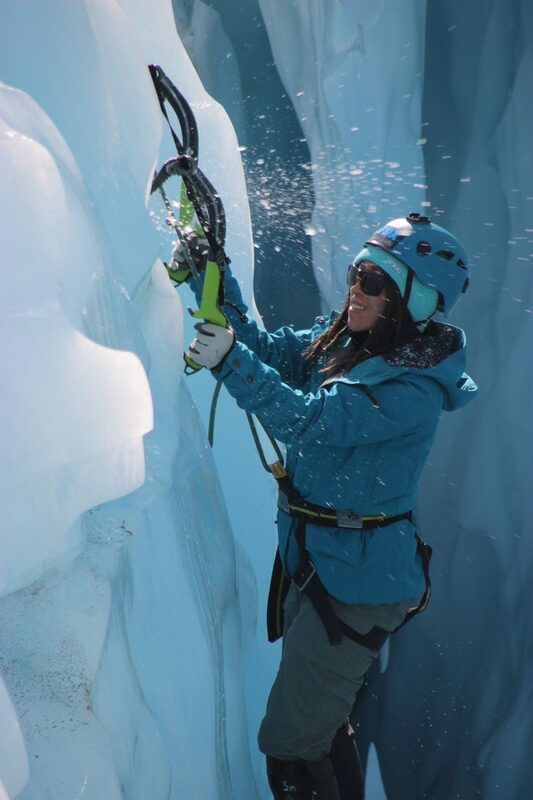 Ice climbing was one of only a couple of experiences we pre-booked on the whole three-week journey, and it was worth every minute of planning! Having made our way swiftly (more swiftly than the abundance of scenery and adventure may have usually dictated) south from the ferry at Picton to Westland Tai Poutini National Park, we take a late afternoon stroll to the foot of Franz Josef glacier before settling down in our guest house in the Village of Franz Joseph Glacier not too far north of Fox Glacier (Both the village and the ice flow). After a steak and a pint (one of my favourite phrases) we hit the sack for an early night ready for our pre-dawn rendezvous in Fox Glacier village the next morning. 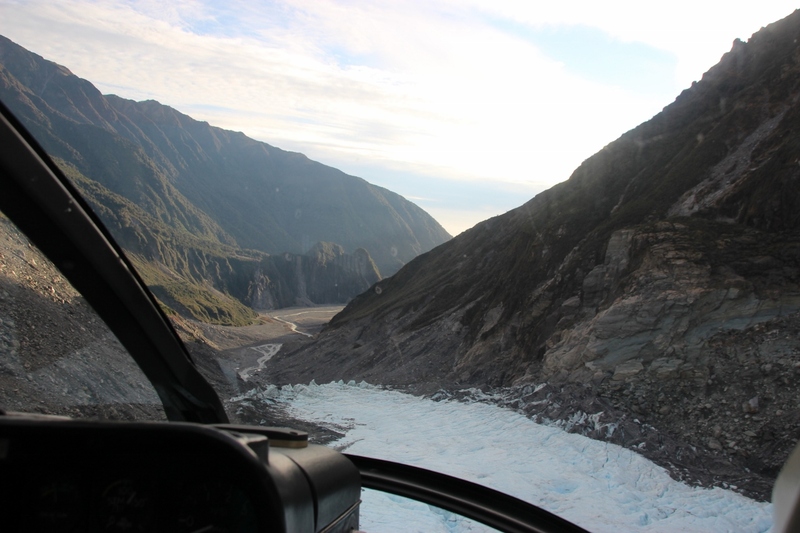 We fronted up to Fox Glacier Guiding as the hearth was still being stoked and were glad of the coffee that was boiling. Before long the other couple that would share our adventure joined us as the fire began to thaw out our extremities. 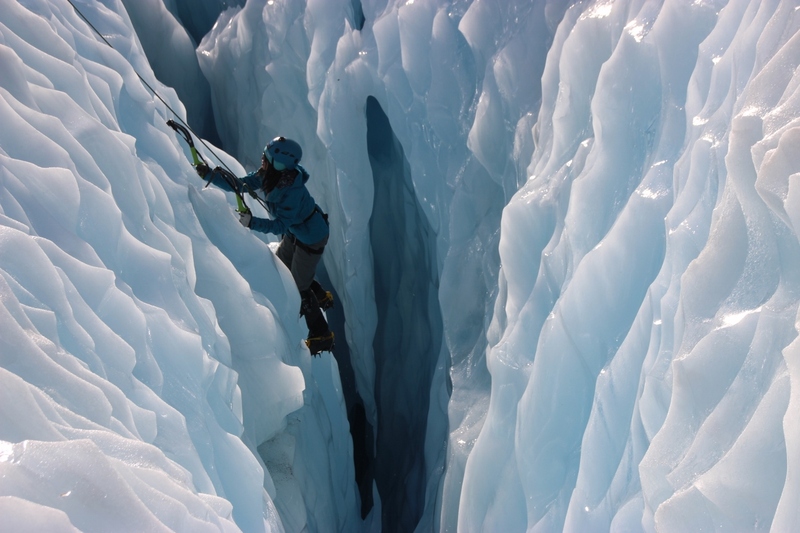 It turns out that for the ice climbing tours, small groups are ideal. 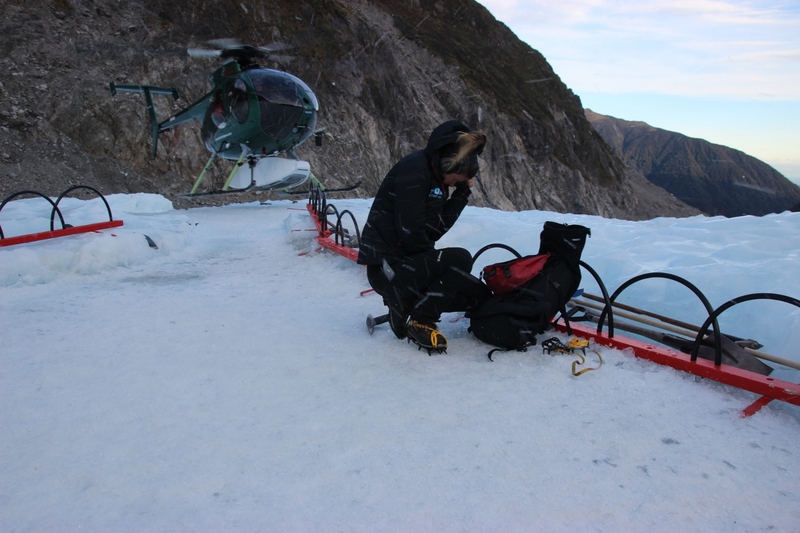 For less adventurous travellers, glacier flights and walks are available, but can you really imagine forking out the not-insignificant cost to set foot on a glacier and not harnessing up!? 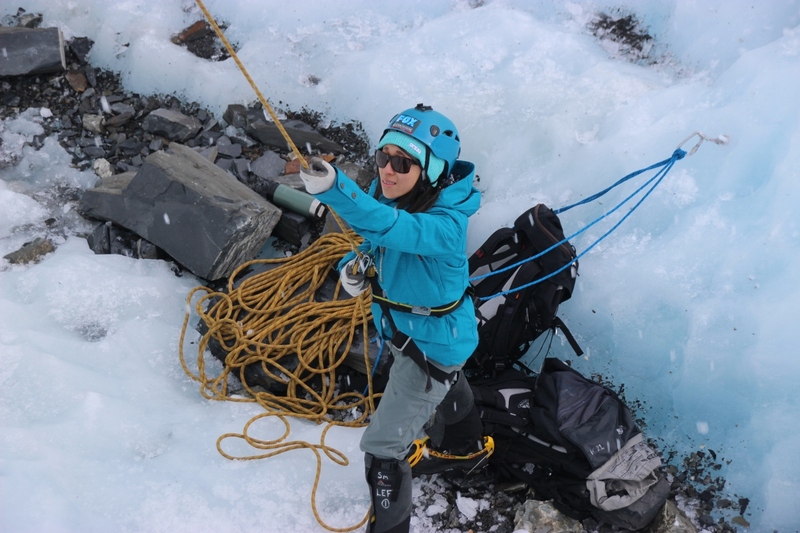 BELAY: Climbing on ice is noticeably more taxing than rock climbing. HITTING THE TOP: One of our early routes during the day. 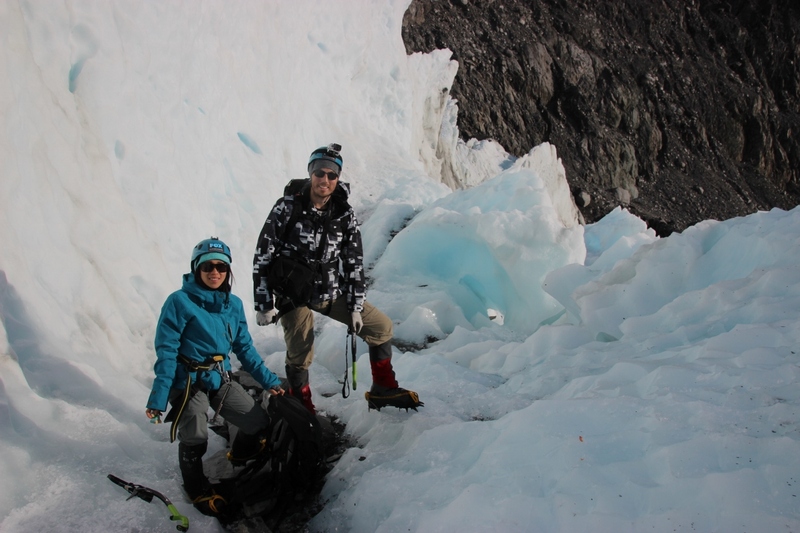 Harnessing up was our next task, sorting crampons, ice picks and all manner of equipment I’d never considered before when heading out for a climb. 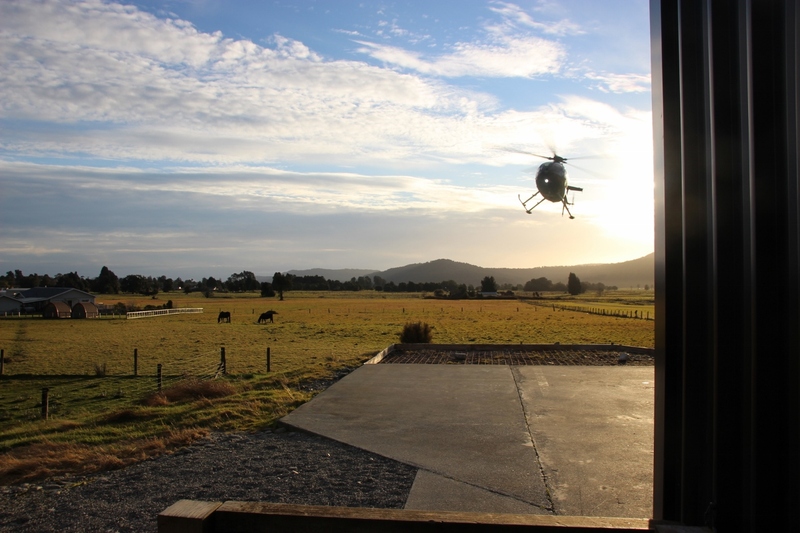 Once kitted out, we piled into a well-used van for our 3-minute transfer to the airstrip. 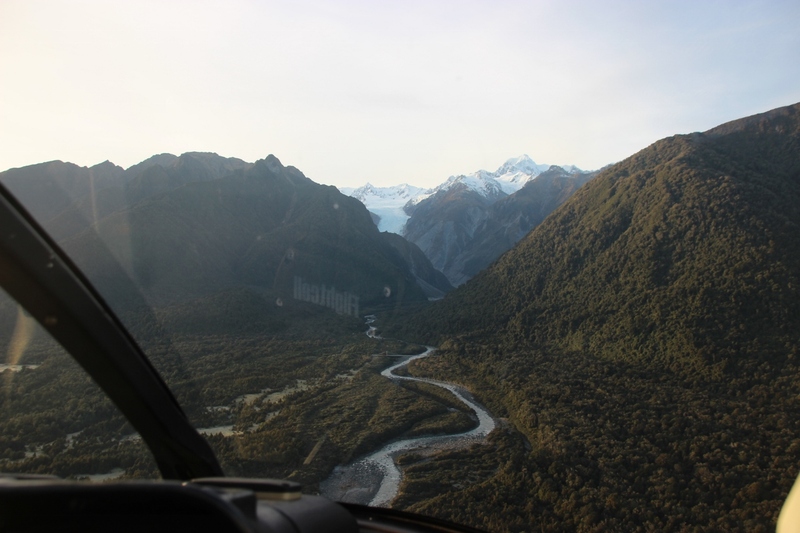 The flight up itself – completed in pairs was mind blowing in and of itself, and this was only the first 20 minutes of our full-day adventure. 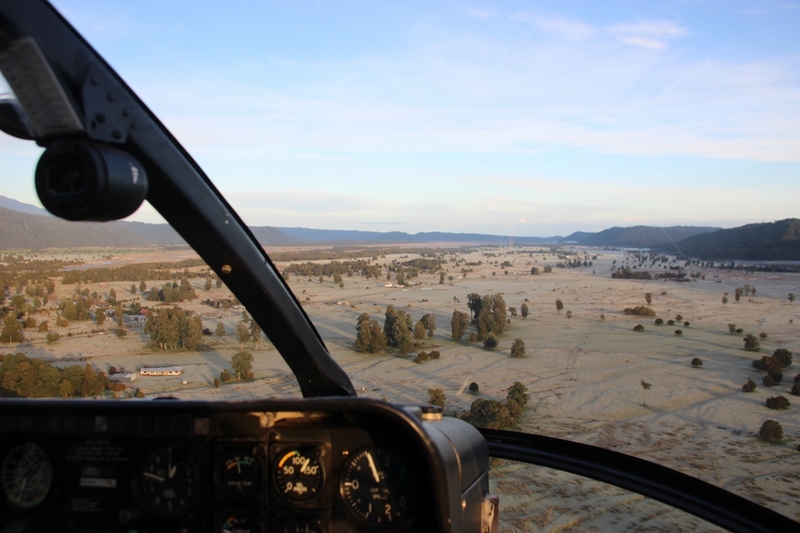 We were deposited onto the flow and instructed to wait for the rest of the crew as they were flown up to join us. 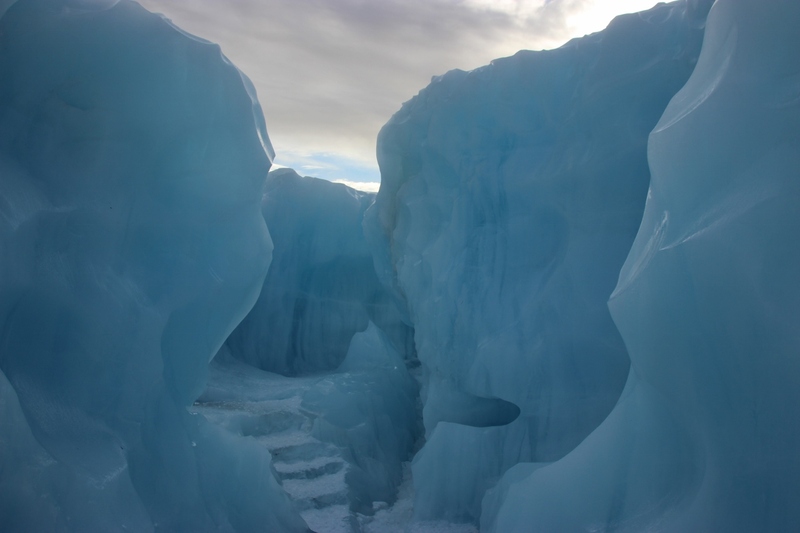 Upon their arrival the gust of ice chunks that were blown into our faces was exhilarating! 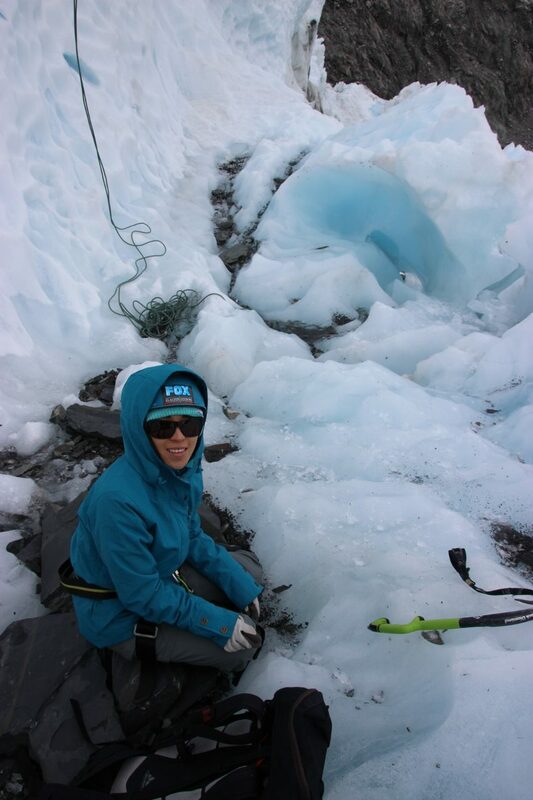 DECEPTIVE: This was our first face, it certainly felt bigger from where I was belaying. 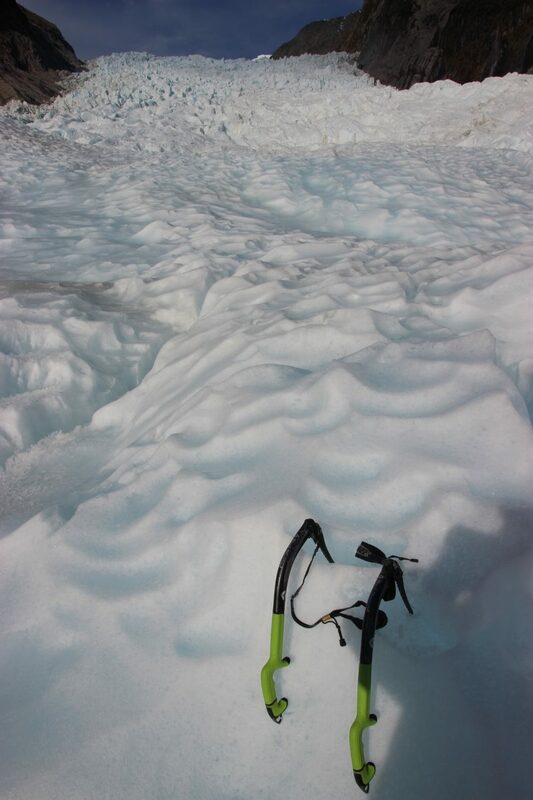 A REST: The view up the glacier during a much needed break. SQUEEZE: An epic looking crawl! 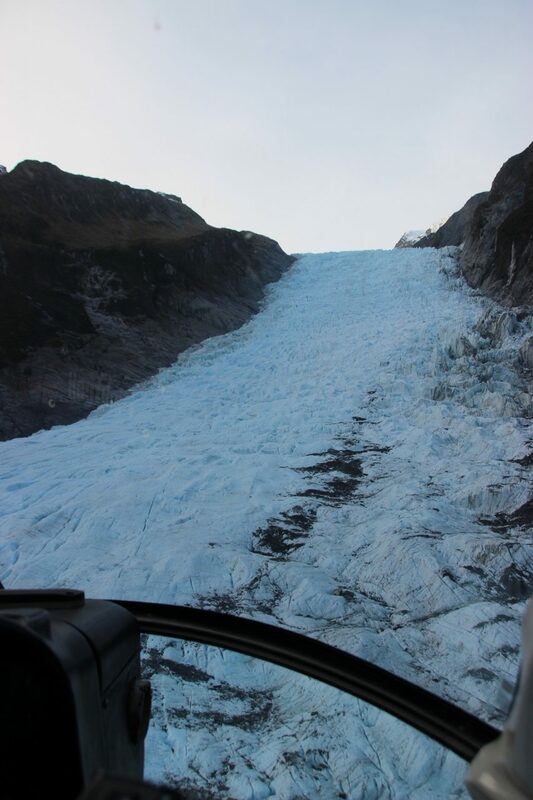 Next we had our chance to take a glacier walk as we made our way to the first face we would scale for the day. 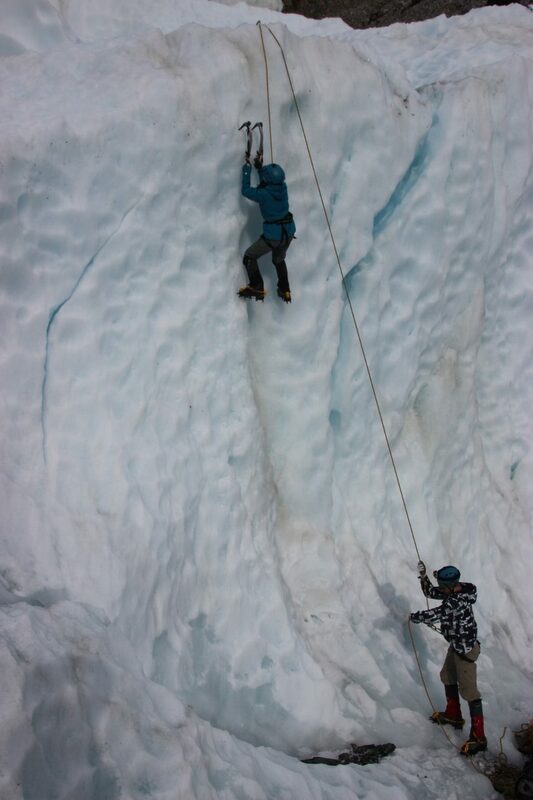 After a few lessons on climbing, ropes, and more importantly ice-specific techniques such as use of crampons and ice picks, we roped up for our first climb. 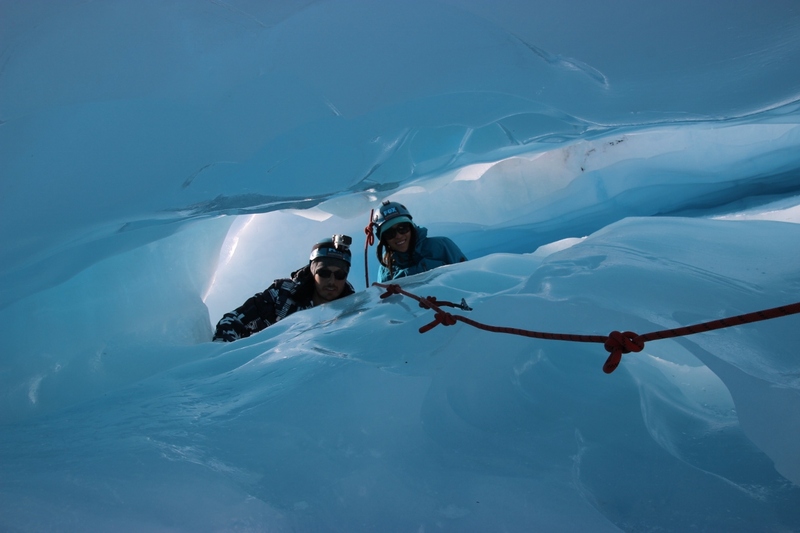 Understandably, considering safety, this adventure was a top roping situation, but considering the extra difficulty posed by ice, and the scenery, I had little to bemoan by the 5-plus hours of climbing we were able to achieve. 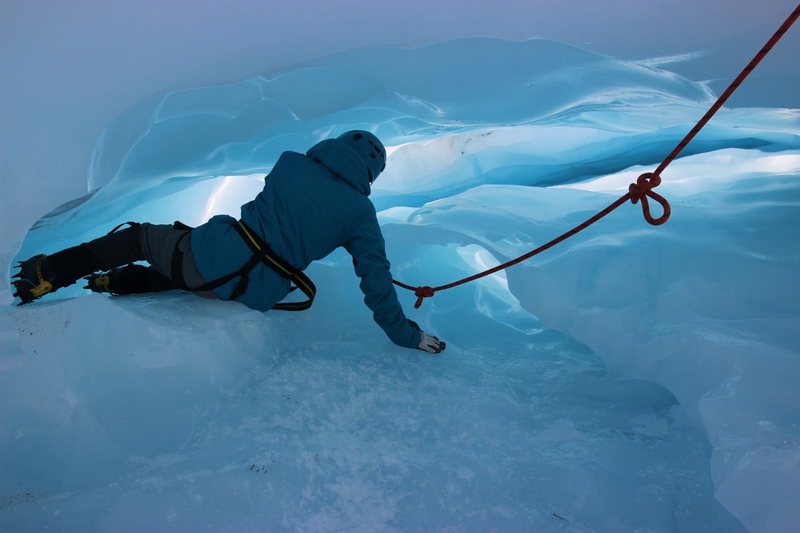 We attempted 3 or 4 faces before tired limbs and chilly fingers forced us into a longer walk to a spectacular crawl space and a few stunningly coloured ice formations. 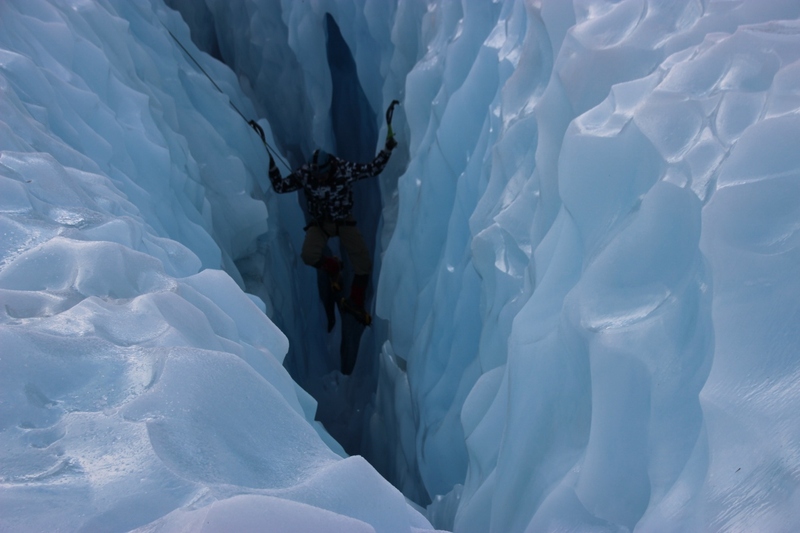 THE GAP: Climbing into and then out of a deep crevice. 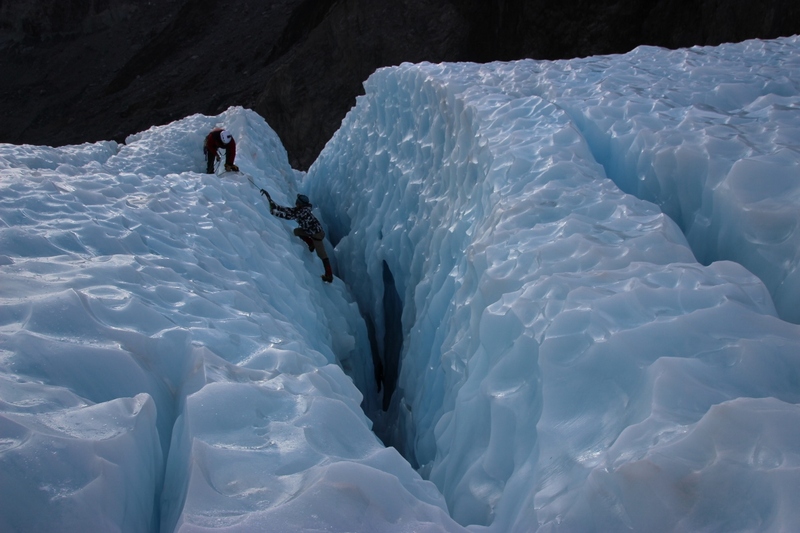 Our last challenge was a particularly sheer and slippery ice crevice in which we were lowered and then challenged to climb back up. By the time we all finished this climb, we were stuffed and ready to head back for another steak and beer! The flight back down was equally as thrilling as the flight up, but with the added satisfaction of a full day of adventurous exercise behind us. 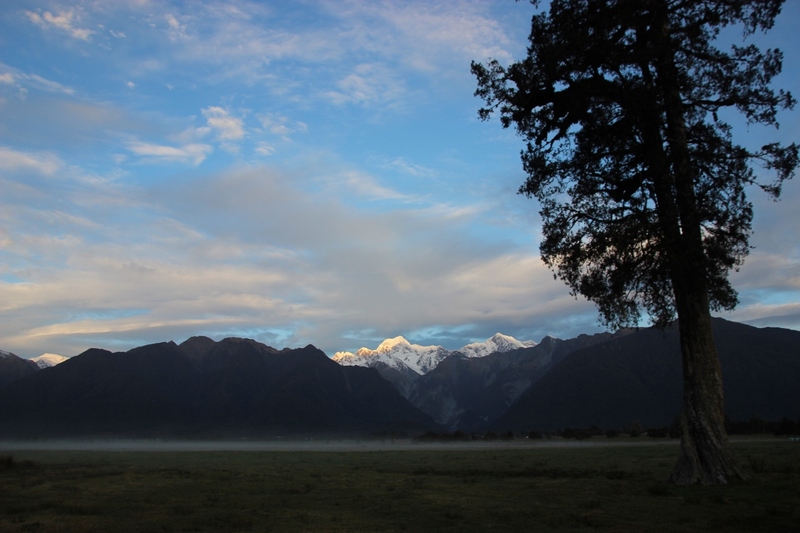 We could very easily have called it a day and headed back to our bed, however the nearby Lake Matheson and the stunning reflection and vista from the circuit around the lake was calling to us. 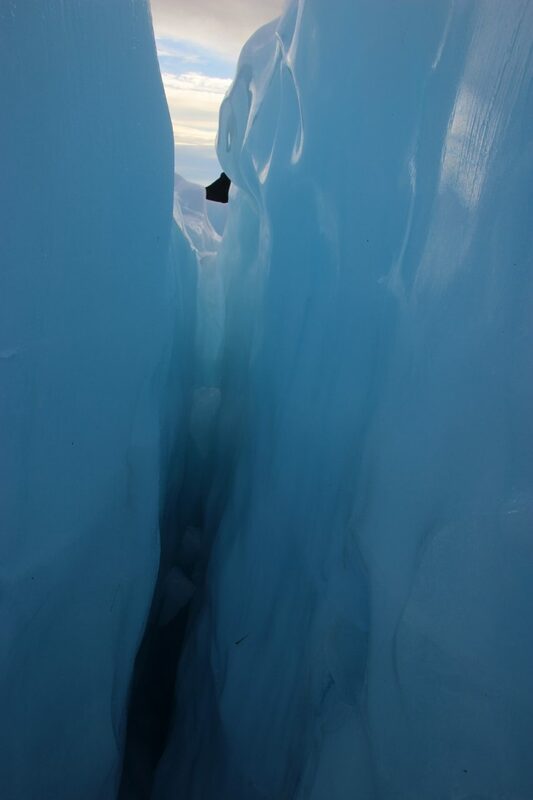 BREATHTAKING: The awesome colours of pack ice in the afternoon light.